Indianapolis, the capital of Indiana, boasts a relatively mild climate making outdoor activities perfect in any season. As the most populous city in the state, there is always something to do, from outdoor concerts on the lawn to visiting any number of parks, there is surely something for everyone. What else does Indy boast? BUGS! Ants, spiders, bed bugs and termites, just to name a few, also love our great city, but there is no need to worry, Action Pest Control is on the job! With an office on Country Club Rd., we're local and we understand the local pest pressures people in Indianapolis are apt to deal with. For ants, spiders and mice, we offer 3 levels of home pest control services that are sure to meet the needs and budget of any homeowner. We offer termite control services to both residential and commercial properties that identifies termite infestation, eliminates current colonies and prevents future termite problems from occurring. Bed bugs are also a problem in Indianapolis, but we've got you covered with bed bug services; from inspection to elimination, bed bugs are no match for Action. If you're sick of insects and rodents trying to make your home (or business) their own, take action and get Action today! At Action we offer four different year-round home pest control programs for our Indianapolis homeowners to choose from to help ensure that the exact services needed to solve any pest problems, in any home, are being performed. Action Pest Control’s Premier program is not only our most comprehensive program, but also our most popular program, and it provides the best protection against a wide variety of pests. This program offers our residential customers with exterior and interior pest treatments, an annual attic inspection, termite monitoring services, a termite inspection, a termite warranty, and termite treatment. Our other quality year-round residential pest control programs include our Essential pest control which provides customers with exterior pest defense services along with cobweb removal. Our Advanced pest control program which provides customers with both exterior pest defense and interior pest treatments; and finally our Complete pest control program which provides both exterior and interior pest treatments, and also includes an annual attic inspection, termite monitoring services, and a termite inspection. Click here, to learn more about our highly effective residential pest control services and to see which program is the perfect fit for your Indianapolis home and budget! Did you know termites are present in every state except Alaska? Did you also know that termites cost homeowners in the U.S. billions dollars every year in damages? It's true! But for homeowners in Indianapolis, Action Pest Control is on the case! We offer termite control services to both residential and commercial properties that identifies termite infestation, eliminates current colonies and prevents future termite problems from occurring. For more information on our termite control services, please contact us today! Since 1946 we have been protecting properties from termites and the damages that they can cause. We are highly experienced in eliminating entire termite colonies and providing the services needed to keep them from returning. At Action we can protect the diverse properties located in Indianapolis from termites through our Five-Step Termite Control System. This system includes: an interior and exterior comprehensive termite inspection of your home, treatment for termites using the highly effective Termidor® which eliminates termites through both ingestion and contact, a three-month termite elimination inspection to make sure that the infestation has been completely eliminated, an annual termite inspection to ensure that your home has remained termite free, and for added peace of mind a money-back guarantee and damage warranty. Protect your property from the extensive and costly damages that a termite infestation can cause by partnering with Action Pest Control, give us a call today to learn more! At Action Pest Control we will work with you to create an environment inside of your Indianapolis commercial facility that will not attract pests to it. 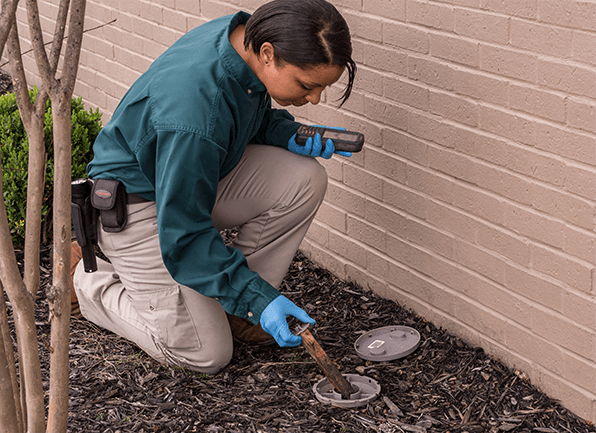 Through our Integrated Pest Management program, we will help you completely eliminate existing pest problems and work to solve the root of your facility’s pest problem(s). Give us a call today to learn more about working together to implement a long-term solution to keep pests out of your business. They can detect any stage of bed bug- egg, nymph, and/or adult. They can detect bed bugs in areas that humans can’t reach or see. Our bed bug dogs can discover an infestation in its infancy before it has a chance to expand. They work very quickly and cause little to no disruption inside of the structure that they are inspecting. Our canine detection team is certified by North American Canine Pest Inspectors- their guidelines exceed those recommended by the National Pest Management Association. If after an inspection bed bugs are discovered, Action can completely eliminate them from your home using heat; heat is an eco-friendly, affordable, non-invasive, and highly effective method that quickly works to eliminate every single bed bug present. Get in touch with Action Pest Control today to learn more about identifying a bed bug infestation and eliminating their presence from your Indianapolis home.